I already downloaded the ArchiMate plugin (tar file), but, could someone tell me how I can install it? 2. Uncompress the archive (double-click on it). The "dropins" directory should appear. 4. Go to the Modelio 3.6 application. 5. 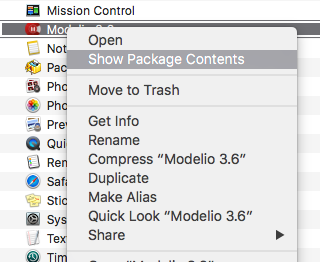 Open the contextual menu on Modelio 3.6 and run the "Show Package Contents" command. I did it as instructed, but... I got an error message. Can you please check the following? 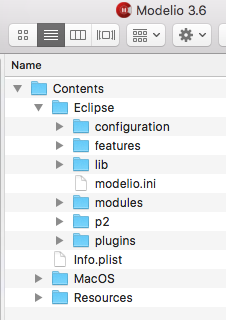 * With Finder, can you go to '~/.modelio/3.6/.eclipse' folder and remove all its content. After this operation, does Modelio Work? 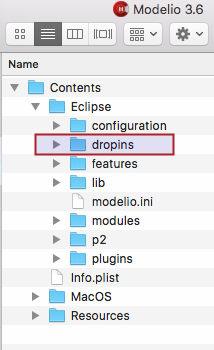 * Does Modelio work if you remove the "dropins" directory? Is it the removal the .eclipse directory content that resolve your problem ?